Gluten-Free, Believe It Or Not! Sometimes, I look back on the ‘olden day’ and remember when a quick pasta dinner was . . . well, quick! Now, when the family gets a hankering for pasta and sauce for a Friday meatless meal, my current recipe begins with, “First, make the pasta.”! I usually end up making the sauce and preparing the vegetables for steaming before making the pasta. That way, I can concentrate on the pasta without worrying about getting the rest of the meal ready. Although I have been known to whimper a bit, I really don’t mind doing it. Homemade pasta just tastes better. And, as I mentioned a few postings ago, companies have been kind to the ‘gluten-impaired’ and there are a lot of great gluten-free flour blends that make things almost back to normal. This evening, my husband liked the idea of having a tomato/mushroom sauce over pasta. My daughter agreed only said to make it so she doesn’t bite into a mushroom. She likes the taste of mushrooms but isn’t crazy about the texture. My favorite flour blend these days is Authentic Foods Steve’s Gluten-Free Flour Blend. BetterBatter Gluten-Free Flour Blend works well, too. All can be found on-line. Check the on-line Walmart store as they often have items you can find in their stores. The recipe for homemade pasta? I’ve probably mentioned it before but just figure on about a half cup flour per person eating and then add one more cup to be sure! Add a good pinch of salt and the eggs. Now, eggs are definitely a variable in this so add them, one by one, and mix until it comes together and then knead. Roll out on a floured board (use either rice flour or the flour blend mix. Cut into strip about half an inch wide and as long as you want them to be! Spread them out on a parchment lined baking sheet and let sit for about 30 minutes until needed. Bring a big pot of water to an energetic simmer, add a tablespoon of olive oil and cook the pasta gently as you add it to keep them separated. It takes about four to six minutes depending on how thick you rolled them out. Drain and rinse with cool water. Serve with your sauce of choice. Beat the eggs and then stir in the oil, milk and wheat germ. Stir in the sugar until it thickens and loses its graininess. Stir together the flour, baking power, salt, and spices and blend into the wet mixture. Add the vanilla, zest, and walnuts. Drop by teaspoonfuls onto a parchment paper lined baking sheet about two inches apart. Bake in a preheated 350 degree oven for approximately 8-10 minutes or until set and golden brown. Makes about 4 dozen cookies. Dip the top of each cooking into the glaze and let dry on a cooling rack. 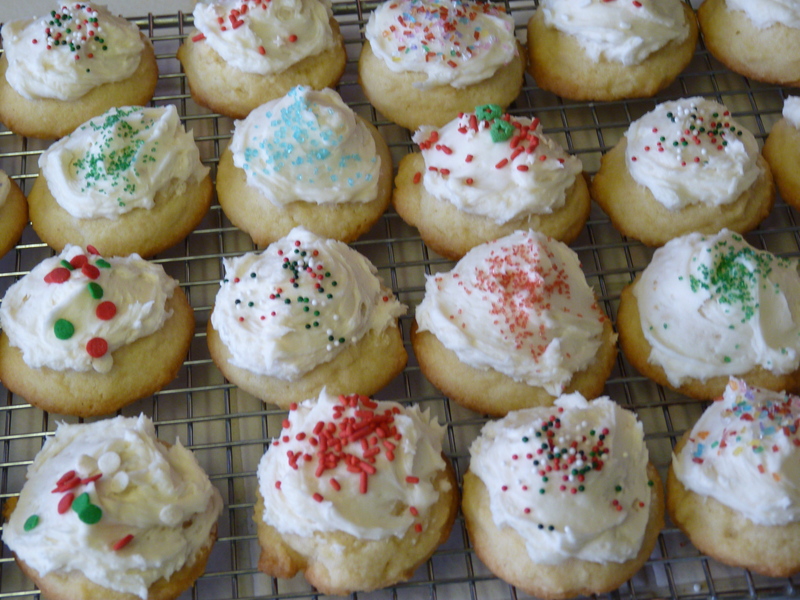 Before they dry, you can sprinkle them with colorful decorations, bits of grated chocolate, etc. Sharing this recipe reminded me to put carrots on my own shopping list for today! Even if you don’t catch the Easter Bunny hiding eggs, you still have a batch of cupcakes waiting to be joined with a cup of coffee. Preheat oven to 350 degrees. Like your muffin tin with cupcake papers. Beat the eggs until frothy. Add the rest of the ingredients and combine well. You can do this by hand or on a low speed with the mixer using the paddle attachment not the whisk. Fill the prepared pan(s) with batter, filling 2/3rds full to allow for raising. Bake for approximately 15-20 minutes or until top springs back when lightly touched. Makes about 2 dozen cupcakes. *What to go fancier? Use a butter cream icing, your recipe or purchased, and go crazy with colorful Easter sprinkles.